OLYMPIA — Attorney General Bob Ferguson today filed a campaign finance lawsuit against Tim Eyman, alleging improper personal use of $308,000 in contributions made to political committees, concealment of contributions totaling $490,185 and misleading reporting. The lawsuit also accuses for-profit signature gathering firm Citizen Solutions of participating in a scheme to conceal campaign money the company funneled to Eyman. If successful, Eyman and his for-profit company, Tim Eyman Watchdog for Taxpayers, could face $1.8 million in penalties, plus $308,000 in reimbursement. Citizen Solutions and one of its principals, William Agazarm, could face penalties up to $924,555. Ferguson will also ask the court to bar Eyman from participating in or directing financial transactions for any political committees going forward. A 2002 agreement permanently barred Eyman from serving as treasurer for political committees. Yet, the lawsuit alleges, Eyman still managed to weave an elaborate web of financial transactions to hide campaign funds, enriching himself while keeping his contributors and the public at large in the dark. This scheme duped contributors who thought they were donating to one initiative, but instead were supporting Eyman’s personal expenses and a completely different initiative. “Taking kickbacks from contractors, using campaign funds for personal expenses, redirecting donations made for one initiative to a different initiative — it’s hard to imagine what more Mr. Eyman could have done to show his contempt for our campaign finance disclosure laws,” Ferguson said. The complaint filed today in Thurston County Superior Court stems from a state Public Disclosure Commission investigation. In August 2012, the PDC received a complaint about Eyman and two of his political committees: Voters Want More Choices and Protect Your Right to Vote on Initiatives. In September 2015, PDC staff presented the results of their investigation to the Commission, which then referred the case to the Attorney General’s Office. On Nov. 13, 2015, the Attorney General’s Office issued civil orders to Eyman, his for-profit company, two of his political committees and Citizen Solutions. The orders sought business and financial information, including banking and tax records, regarding Eyman initiative campaigns in Washington. While the respondents produced a smattering of records, some of which were heavily censored, they did not fully respond to the subpoenas. In June 2016, a judge ordered Eyman to comply with the subpoenas in the Attorney General’s investigation. Even then, the defendants failed to meet the court-ordered deadline, and it took a contempt motion to obtain the records. In September 2016, the courts ordered Eyman, his political committees and Citizen Solutions to pay the Attorney General’s Office a total of $33,000 for the costs of enforcing subpoenas in the investigation. “Voters Want More Choices – Save the 2/3’s” was a political committee with one treasurer and three officers, one of whom was Eyman. VWMC was created to support Initiative 1185, which would have required a two-thirds majority for legislative actions raising taxes. On April 2, 2012, Eyman signed an agreement on behalf of the committee with for-profit signature gathering firm Citizen Solutions to provide signatures to qualify I-1185 for the November 2012 General Election ballot. VWMC agreed to pay Citizen Solutions $3.50 per signature, a total cost of over $1 million. Over the course of the signature drive, VWMC paid $623,325 to Citizen Solutions for signature gathering. In addition, VWMC reported receiving $495,000 in in-kind contributions from the Association of Washington Businesses PAC and $100,000 in in-kind contributions from the Washington Beer and Wine Wholesalers for direct payments to Citizen Solutions for signature-gathering services for the I-1185 signature drive. Those contributions were not part of this investigation. The total payments by VWMC and the in-kind contributors to Citizen Solutions for I-1185 signature gathering amounted to $1,218,325, for a total of 320,003 signatures. 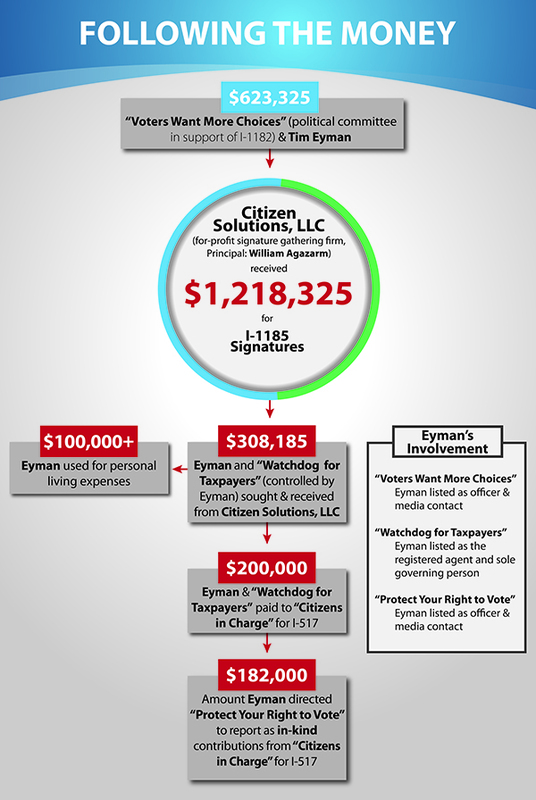 Immediately after the I-1185 signatures were delivered, Eyman and his for-profit company, Tim Eyman Watchdog for Taxpayers, sought and received $308,185 from Citizen Solutions. The payment was delivered via wire transfer July 11, 2012 — four days after the signatures were delivered. This payment was not reported to the PDC, and, the lawsuit alleges, constitutes concealment, a violation of state law. Eyman did not communicate to VWMC that he was receiving this money. Because VWMC did not report the payment to Eyman in its reports, the lawsuit further alleges Eyman caused the committee to file five inaccurate and misleading reports. Each report is a violation. These funds went to Eyman’s personal use. Every transaction he made using the $308,185 for his personal use constitutes a violation of state law, the lawsuit alleges. Eyman expected the money he paid to Citizens in Charge to be used for I-517. The lawsuit alleges these payments also constitute personal use, and violate state law. Citizens in Charge did spend the money on signature gathering for I-517. They sent the signatures to another Eyman committee, Protect Your Right to Vote on Initiatives. The value of these signatures was reported as $182,000. However, instead of reporting Eyman as the source of the $182,000 in-kind contribution, Eyman directed the committee to report Citizens in Charge as the source. The lawsuit alleges Eyman concealed the true source of the $182,000, a violation of state law, and caused the committee to file three inaccurate and misleading reports. Each report is a violation. Under state law, sanctions for campaign finance disclosure violations can include a penalty equal to the amount not reported. If the court finds that the violation was intentional, that penalty can be tripled. Eyman concealed the true source of $182,000 in in-kind contributions to Protect Your Right. If the judge finds this to be intentional, that penalty could total $546,000. Eyman caused VWMC to file three inaccurate or misleading reports related to its payments to Citizen Solutions, with a penalty up to $10,000 per report. If the judge finds this to be intentional, that penalty could total $90,000. Eyman caused Protect Your Right to file five inaccurate and misleading reports related to contributions it attributed to Citizens in Charge, with a penalty up to $10,000 per report. If the judge finds this to be intentional, that penalty could total $150,000. 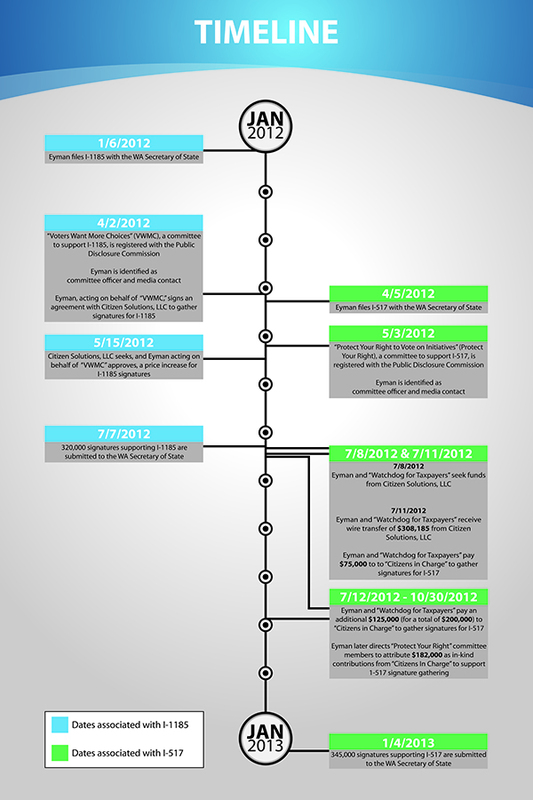 If all violations are proven and found intentional, Eyman’s penalties could total $1,860,555. Additionally, Ferguson will ask the court to order Eyman and his company reimburse to VWMC $308,185 for his improper personal use. Today’s lawsuit is unrelated to separate actions filed in September 2016 against Eyman, four political committees and their officers and treasurer. Those lawsuits allege shoddy accounting practices and improper disclosure of the source of funds for the committees and their ads violated Washington law. The defendants will have 20 days from the date they are served to respond to the state’s complaints. Senior Assistant Attorney General Linda Dalton and Assistant Attorneys General Walter Smith and Jeff Sprung are handling the case. The Attorney General’s Office enforces the state’s campaign finance disclosure law to ensure free, open and fair elections in Washington state. Since becoming Attorney General, Attorney General Ferguson has devoted more agency resources to campaign finance casework.